Welcome to Sanderson Marine - Norfolk Broads Cruiser Hire. 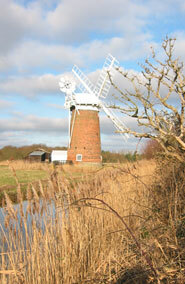 Sanderson Marine is situated on the north bank of the River Yare, in the pretty Norfolk boating village of Reedham. We offer a choice of 13 broads river cruisers, equipped to facilitate 2 - 9 persons. Setting out from Reedham offers three different starting directions for your Norfolk Broads Boating Holiday, through the very popular village of Brundall, to the historic city and beautiful rivers of Norwich. Oulton Broad is also a popular mooring place amongst visitors to the Norfolk broads not forgetting to mention the Suffolk market town of Beccles or through to Gt.Yarmouth. However we offer 3 or 4 day short breaks, full week - 10 or 11 day hire, or longer. Ask us if you have a few days available and we will accommodate you if we can.